Are you tired of all the Drupal and WordPress posts we've been doing lately here at CMS Report? Not my fault...I only report the CMS news! The fact is that among the open source CMS that I post about...both Drupal and WordPress have been churning out a lot since the New Year started. The release of Wordpress 2.0.7 is just a good example as any. On Drupal's sixth birthday Dries Buytaert announced that Drupal 5.0 has been released. The 5.0 version of the content management system is considered a very significant release by its open source community. Consider this, it's been almost half a decade since Drupal 4.0 was released. This just goes to show you how small of a world it is. Traffic to CMS Report is usually rather light over the weekend, but I noticed an increase in the number of people visiting the site Saturday and Sunday. These "new" visitors were coming from Lorelle VanFossen's WordPress blog. She recently posted an article on some of the features expected in the yet to be released WordPress 2.1. Depending on whom you talk to, certification programs are either borderline rip-offs that provide little useful knowledge, or valuable hiring tools that make it easier for IT execs to pick the most promising new employees. 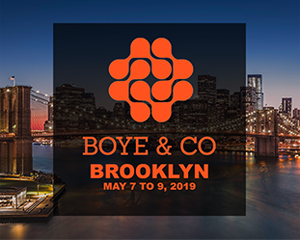 Available from vendors focusing on their own products, or outside organizations offering multi-vendor training, these certificate programs are expanding to fill the many specialized technology subsets that have multiplied along with the growth of data storage and other IT areas. Now this isn't to say that I don't have a few IT certifications under the belt and didn't receive some benefit from them. One of the most intensive IT certifications of recent years was in IT security and another to "please" the crowd was a certification for migration to Microsoft's Server 2003. By the time I was done with those certifications though, I didn't know enough to get the job done. Read more about Are certification programs a scam? A new point release of WordPress was released, WordPress 2.0.6. Not only some security and bug fixes are included in this release but also some minor new features. Philippe Archambault wrote to us that he is working on a PHP version of Radiant CMS. Radiant CMS is based on the Ruby language. Mr. Archambault has appropriately named his CMS, phpRadiant. If imitation is a sincere form of flattery, then lets hope the Radiant CMS folks are blushing! Wayback challenge: When was your first site? While most bloggers are using the new year to look ahead, I am not quite ready to make promises to the year of 2007. In fact, I am more inclined to looking at the past thanks to the Internet Archive's Wayback Machine. I'd like to challenge anyone who has designed a web page to find the oldest site in the archive that they authored and post the Wayback Machine link in the comment section of this post. There are no prizes being awarded in this "contest" but I promise you can have some space for bragging rights. Feel free to include any history on the page that you feel is necessary to tell your story. The archive contains archived web pages from 1996 to the near present. 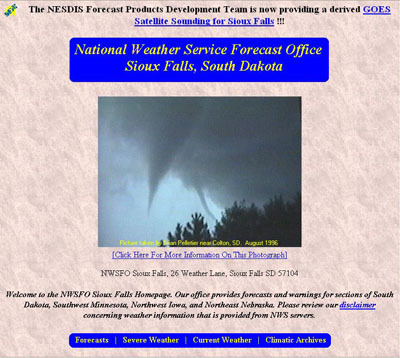 The oldest web pages I could find that I authored was from 1997 for the National Weather Service's forecast office in Sioux Falls, SD. The above site actually originated in March 1996, but this 1997 image is the earliest I could find in the archive. Not very impressive is it? However, you have to remember that I was authoring with HTML 1.x and worried that Netscape's introduction of the blink element was pushing the envelope further than I wanted to go. Read more about Wayback challenge: When was your first site? "Leadership. Communication. Strategy. Diplomacy. Money. Technology. Industry. These are the things IT leaders must master." I wish everyone a Merry Christmas! I've been very fortunate to see CMS Report's numbers of visitors grow as much as it has this past year. While I don't always have all the CMS answers out there, I hopefully have shown that I do have the enthusiasm to keep plugging away. Better yet, I've been able to connect with some people who are just as obsessed as I am with content management systems and other information systems. This year has been a good one!